sometimes babies are made sooner than planned. that doesn't make it less of a gift, once the shock wears off (hehe). 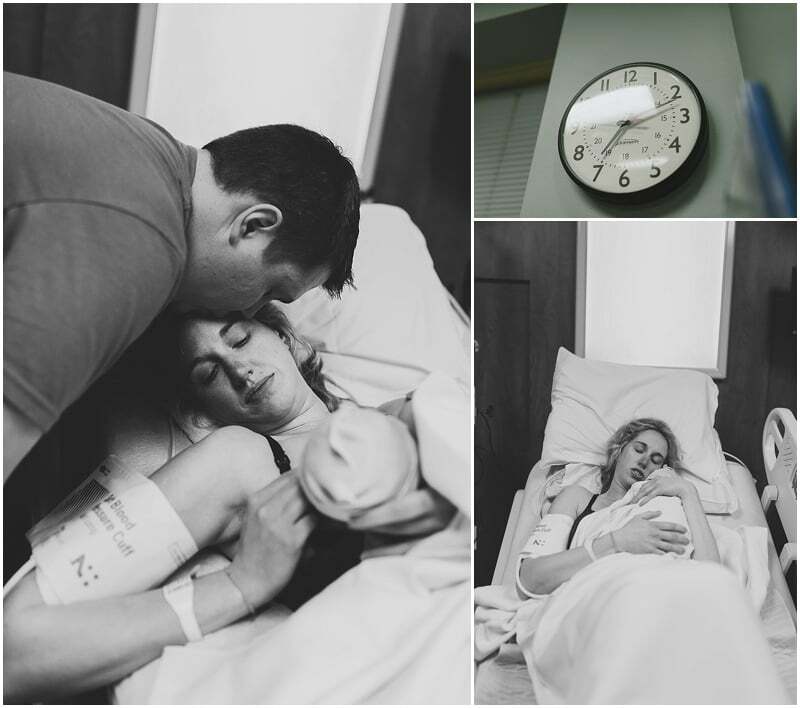 i photographed amy and darren's first birth in April 2014, so when she contacted me in April 2015 about photographing the birth of baby #2 in December, it was a (joyful) surprise! they would be my first "repeat client" for birth story photography. and what an amazing family to do this with a second time! i was in awe of them as they brought ellison into the world, and i knew i was in for a real treat in witnessing the birth of their next little one. we planned for me to meet them at their house when amy was in mid-labor, so as to get some photos of them laboring at home, which they wanted to do as long as possible before heading out to the hospital. but then i got a text from them that said simply, "go to hospital." "now?," i replied. "yes," they typed. knowing that her last birth progressed very quickly once she arrived at the hospital, i set out immediately, meeting them and their doula, brenda, at admitting, and parking their car for them while darren helped amy into a wheelchair and through the doors to the hospital. in admitting, amy was "only 5 cm" but we all knew that, given her history, that gave NO guarantees that it would be long before she was ready to give birth. we were brought up to labor and delivery after a wait that felt uncomfortably long for amy, though it was brief in the grand scheme of things. once in their room, brenda got to work creating ambiance with candles, essential oils, and positive affirmations posted around the space, while amy got into the tub as soon as the nurse felt comfortable letting her do so. she labored only a short while in the tub before her waters broke and she rose to her feet, announcing that the baby was coming. brenda rushed into the hall and shouted to the nurses that it was time. a scramble commenced, with the midwife (also named brenda) coming in to usher amy to the bedside just in the knick of time to help ease the baby's head out! my favorite moment was the one where the midwife passed the baby up to amy, who brought him up to her chest, then laid down on the bed, holding him close, with relief and love washed over her face. so much powerful emotion there (and now one of my favorite birth photos ever). the gender was a surprise, so there was also an amazing moment when they declared, "it's a boy!" very shortly after his birth, before he was even weighed and measured, amy's parents came, bringing along ellison. these moments of introduction between a baby and his sibling(s) and grandparents are absolutely awesome. and can we just say how amazing darren is?! he's a rock, and he also cannot keep his overwhelming love and joy from showing all over his face!